Testing and commissioning of Alstom’s first Citadis X05 light rail vehicle (LRV) has begun in Sydney, New South Wales, Australia. The LRV was the first to be delivered worldwide in August, 2017. Other orders are also being fulfilled for Nice and Avignon, France, as well as Kaohsiung, Taiwan. Sydney’s fleet of 60 Citadis LRVs have been ordered for the 12km-long Central Business District and South East Light Rail project, a new light rail line in the state’s capital city. 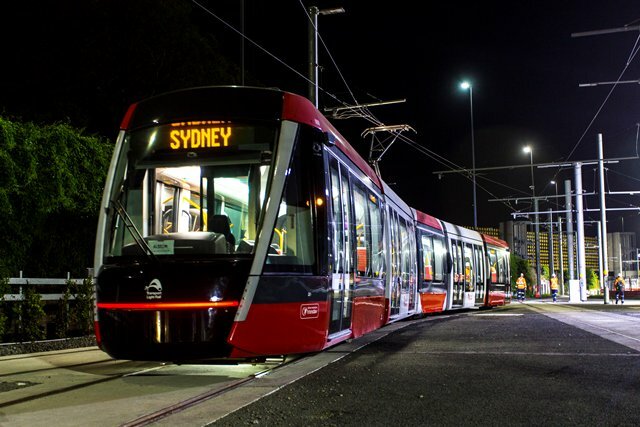 The testing and commissioning of the first LRV will take place at night on a completed part of the network in Sydney’s eastern suburbs. The vehicles will initially operate as 33m sets and will progressively expand their commissioning of the network as further sections are completed. The entire fleet will be tested and commissioned by the end of 2019. When the project is complete in 2019, the LRV’s will operate at speeds of up to 80km/h in a 67m couple set, which will have a capacity of up to 450 people. The network will have a capacity to move up to 13,500 passengers per hour. The LRVs include double-doors for improved access and passenger flows, large balcony style windows, CCTV, emergency intercoms and the latest wayfinding aids for passenger information and real-time travel information. Alstom has said that the vehicles’ impact to the environment will be minimised through increased energy efficiency achieved by the use of electrical braking, permanent magnet motors, LED lights, sensor-based air-conditioning and the use of water-based paints and non-hazardous materials for construction. According to the manufacturer, each vehicle is 99 per cent recyclable at the end of its 30-year lifespan.